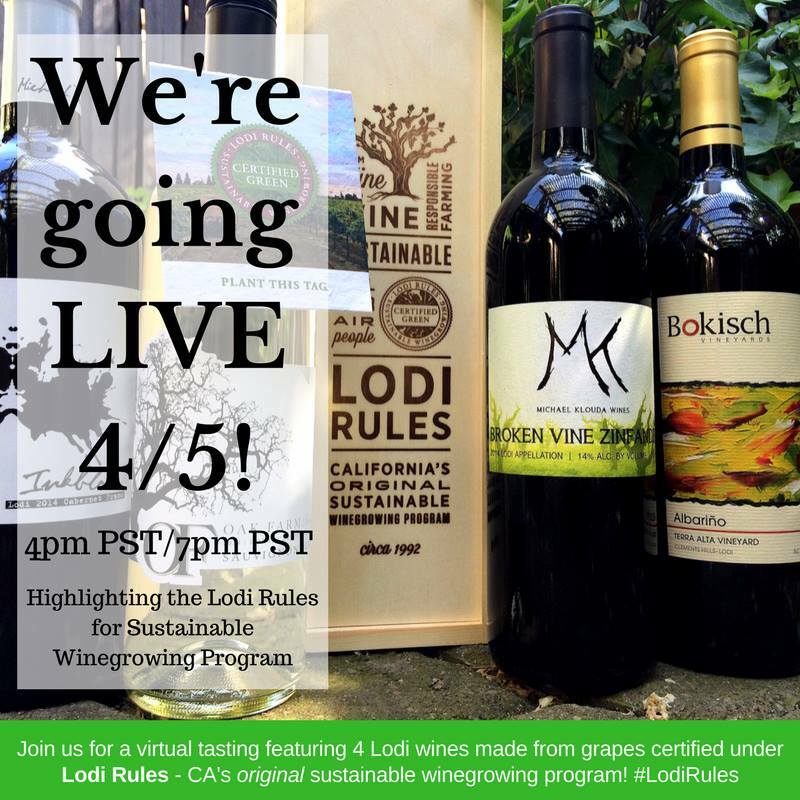 Home / Announcements / Lodi Rules Live Virtual Wine Tasting at 4 PST! Lodi Rules Live Virtual Wine Tasting at 4 PST! Just a quick post to let you know I’ll be participating in the Lodi Rules Live Virtual Tasting at 4 PST today on Facebook! Head to the Lodi Wine Facebook page to join in. We’ll be tasting the wine pictured in that promo shot – Michael David’s 2014 Inkblot Cabernet Franc, Bokisch Vineyards’ 2013 Albarino, 2014 Michael Klouda’s Broken Vine Zinfandel, and Oak Farm’s 2016 Sauvignon Blanc. Except for the Broken Vine, I’ve tasted versions of all these wines before, and they are delicious. I’m quite looking forward to becoming reacquainted with them. The “we” mentioned above is myself and other wine bloggers who’ll be participating along with winegrower Aaron Shinn and winemakers Chad Joseph and Stuart Spencer. Spencer, of the St. Amant winery that I recently wrote about, will also be representing the Lodi Winegrape Commission. This is going to be great, especially because the Lodi Rules sustainability program pairs so well with Earth Day! Hope you stop by the event to learn about how Lodi is setting an example for the rest of the winemaking world to follow.